I’m such a cheesecake kid, but I get upset when cheesecake is done wrong which I think is WAY too common. When cheesecake is just sweet mush with no tartness at all, or way too dry, or lacking flavor in general, it gives me the sads. This amazing Sour Cream Cheesecake is none of those things, it has an incredible texture, soooooo creamy, I don’t know how it’s possible that it can be so creamy dreamy and still be totally set, but it is! Plus the flavor is perfection – sour notes from the cream cheese and sour cream but balanced perfectly with the sweetness from the sugar and heavy cream. And I’ve never met a recipe that bakes at only 250, so I was curious, but I put my trust in Alton Brown who is obviously a kitchen genius and the result was brilliant. I can’t wait to make it again, it really wasn’t a difficult recipe and people went crazy for it, I hope you enjoy as much as we did! Preheat oven to 300 degrees F. Brush some of the melted butter around a 9 by 3-inch cake pan. Adhere parchment to the bottom and the sides. You can also use a springform pan that you line on the outside with foil so your water bath doesn’t leak into your cake. In a small bowl, combine crumbled graham crackers, the remaining melted butter, and 1 tablespoon of sugar. Press the mixture into the bottom of the parchment-lined pan pressing into an even layer on bottom and up on the sides as far as you can, mine reached a good 1/2 inch or so. Bake crust for 10 minutes. Cool. In a mixer with a paddle attachment, beat sour cream for 10 seconds. Add the cream cheese and sugar and mix on low for 30 seconds and then turn up to medium. Scrape the bowl. In a separate container, combine vanilla, eggs, yolks, and heavy cream. With the mixer on medium, slowly pour the liquid mixture in. When half of it is incorporated, stop and scrape. Continue adding the mixture until the rest of the ingredients are incorporated. Once completely combined, pour into the cooled crust. Lower oven temperature to 250 degrees F. Place cheesecake into a preheated water bath, in the oven for 1 hour. Turn the oven off and open the door for one minute. Close the door for one more hour. Remove the cheesecake from the water bath and place in the refrigerator for 6 hours to completely cool before serving. When ready to serve, place the entire cake pan with foil around bottom if in a spring form into a hot water bath for about 15 seconds. Unmold onto a cake round or serving dish. To make the Chocolate Crust – If planning to use a water bath, double-wrap outside of a 9-inch springform with 3-inch high sides with aluminum foil (heavy-duty if you have it). If you aren’t doing a water bath, still wrap at least once as there is not in existence a springform pan that does not leak that I know of. In a food processor, blend cookies, chopped chocolate and brown sugar together until finely ground. Drizzle in melted butter and process until crumbs begin to stick together, scraping down the bowl if needed. Transfer crumbs to prepared pan. Wrap fingers with plastic wrap and press crumb mixture up sides to within 1/2 inch of top, then evenly over bottom of pan. It helps to use the bottom of a cup to even out the bottom layer of your crust. Chill crust until next step. Make fudge layer: Bring cream to simmer in large saucepan. Remove from heat; whisk in chocolate and peanut butter, if using, until chocolate is melted and mixture is smooth. Pour into bottom of chilled crust and spread in an even layer. Freeze until fudge layer is firm, about 30 minutes. Make cheesecake layer: Using electric mixer, beat cream cheese, peanut butter, and sugar in large bowl until well-blended and fluffy. Beat in sour cream, then eggs, one at a time, and vanilla. Mix until smooth. Pour over fudge layer that has set in the freezer. To bake in a water bath: Place foil-wrapped springform pan in a roasting pan large enough to hold it. Fill roasting pan with enough hot water to come 1-inch up the sides of the springform and carefully transfer to middle oven rack. To bake without a water bath: Place springform on middle baking rack. Both methods, to bake: Bake cake until slightly firm to the touch and the top appears dry, about 75 to 90 minutes. 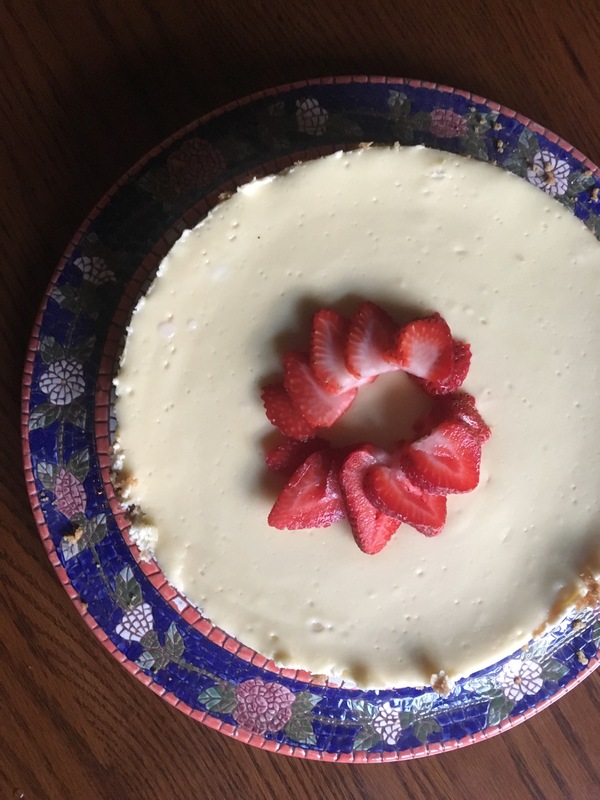 Cheesecake done times can be very tricky – Deb from Smitten Kitchen recommends this visual guide: The center two inches should only move slightly when pan is gently shaken. Transfer cheesecake to rack in the fridge until fully cool, at least three hours. Make ganache topping: Heat cream in a small saucepan until simmering. Off the heat, whisk in chocolate. Pour on top of chilled cheesecake and spread to the edges. Return cheesecake to the fridge until the ganache sets, about 30 minutes. To serve: Remove foil from outside cheesecake pan if you have not already. Gently cut around between edge of cheesecake crust and springform pan to make sure it isn’t sticking. Unhinge the sides. You can serve it on the springform base, or, if you’re feeling confident, slide a knife gently under the bottom crust to loosen it from the springform base and slide the cake onto a serving plate. Serve in very small wedges. Cake keeps for a week in the freezer and longer in the freezer.